NCMB, in collaboration with several partners, has developed a new resource for prescribers to help educate patients about safe medication storage and proper disposal of unused, unneeded prescription drugs. Information is printed on a two-sided color tearsheet, which can be given to patients when prescriptions - especially for frequently abused medications such as opioids, benzodiazepines and stimulants - are issued. The tearsheets are available in pads of 50. 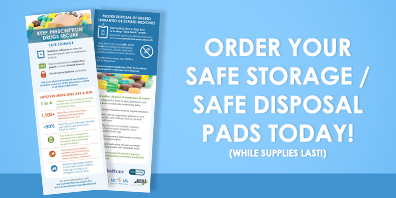 NCMB will send a supply of the safe medication tearsheets to prescribers at no charge, while supplies last. Email news@ncmedboard.org to request a shipment. NCMB is grateful to Project Lazarus, United Healthcare, the North Carolina Medical Society, the North Carolina Healthcare Association for their support of this project. For more information about safe medication storage and disposal, visit www.ncmedboard.org/safedisposal.